Horus Lupercal – Work begins! By The Emperor! I spent two hours kicking off the saga that will be painting the Forge World Horus figure… and it looks like I’ve done nothing! Now I had made a sort-of-unofficial vow that I wouldn’t post WIP pictures on here anymore, as for a while that’s all this blog seemed to consist of, but as this will be a rather large ongoing project I feel it’s OK in this case. Author PaulPosted on February 6, 2019 Categories Work In Progress (WIP)Tags Forge World, Games Workshop, Horus, Horus Lupercal, Resin miniatures, Warmaster, When Cannons Fade2 Comments on Horus Lupercal – Work begins! A little more Bushido – Taka and Wrath. Welcome friends! As I sit and write, I can’t quite get my head round that we are already two thirds the way through January! The last several weeks have been somewhat of a whirlwind with the holidays, family coming in from overseas and the onset of a frigid winter. While we have retired to winter quarters for the cold months, I’ve had little time for picking up a brush. I don’t know about any of you lot, but if I don’t get at least a couple hours a week at the painting table, I get cranky. Author PaulPosted on January 22, 2019 January 22, 2019 Categories Miniature painting and techniquesTags Bushido, Cult of Yurei, Forge World, Games Workshop, GCT Studios, Horus Lupercal, Taka, The Horus Project, Warhammer 40000, Wrath, YureiLeave a comment on A little more Bushido – Taka and Wrath. Score! Some retro GW figures – Cheap! Of course I swooped on it, especially for a mere $10! I wanted a set of these to paint up and possibly use in Judge Dredd as Juvies or something. It was a complete set too! I love finding some of the older stuff out in the wild still. The thrill of the hunt! (Even though I wasn’t on ‘the hunt’ that day). So I’m considering picking up the new Necromunda, I really like the new Escher minis and I’m really liking the small scale skirmish games GW is finally embracing (again. It took how long for them to realize?). What’s everyone’s thoughts on it? Should I get it, or would I be better off picking up Kill Team? Author PaulPosted on September 18, 2018 Categories UncategorizedTags Citadel Miniatures, Games Workshop7 Comments on Score! 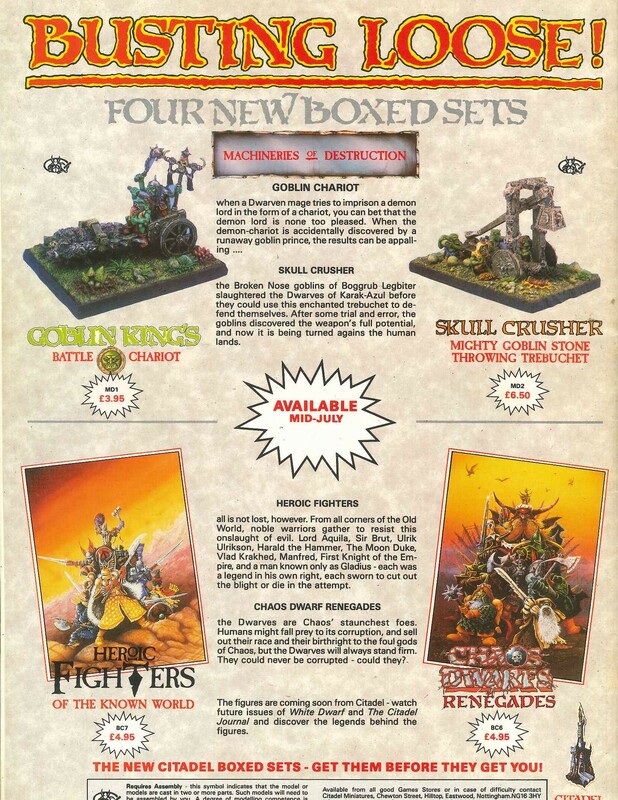 Some retro GW figures – Cheap! Another couple of strikes from the D20 painting spreadsheet I posted a little while back! First up was the Recon Trooper from the Fortune Hunters faction. I love all the Deepwars minis, although I will admit that one or two do have some little things that grate on me a little, and this guy is an example of that. A really nice miniature in and of itself, but the scale of this guy is way out of whack with some of the other figures in the faction. If this guy was standing up, he’d be more than a head and shoulders taller than some of his fellow hunters! I love the animation of the miniature here, and it really lends itself well to making you think he’s swimming in some uncharted depths, looking for some precious ether crystals. I believe he’s wearing some kind of propulsion pack on his back, which I’m assuming may grant him some ability in the game (I haven’t had chance to read up on him yet). Next up: a Dark Mariner Vanguard marine. I really dig the designs of this faction, a mish-mash of crustacean armor with lots of Cthuluesque gribbly bits. Quite sinister with their tentacles squirming out from behind armor plates and cold eyes staring at you from within the darkened eye slits of plumed helmets. I had to repair this guys weapon as when he arrived the upper portion of his halberd had snapped off, just below the *ahem* glowing balls. I received a second one of these in one of the starter sets, and it looks as though the same thing may be about to happen with that one as well. A friendly note to the folks at Antimatter Games – maybe throw in a bit of extra padding for this particular miniature, it’s way too nice a piece not to go that extra mile with packing!! For the next selection on the D20 list, the wifey rolled 18… a Kamau hacker for Infinity. I’ll start that one in a couple of days, as there are a couple of other projects I need to wrap up. Author PaulPosted on June 7, 2018 Categories Miniature painting and techniquesTags A song of Blades and Heroes, Antimatter Games, Dark Mariners, Deepwars, Eldar Harlequins, Fortune Hunters, Games Workshop, miniature painting, Shadowsea, skirmish gamesLeave a comment on More Deepwars minis completed! By Chaos You Are Boooound! Any excuse to have an intro by the mighty Bolt Thrower and I’ll take it! Anyway, it was the lead in to me posting the pictures of the Foul Blightspawn miniature that I finished last week for a painting competition at Grognard Games. He kinda looks like a Ghostbuster, or maybe a Grossbuster? I don’t know. I know I’m not much a fan of the name (some of the Nurgle character names are a wee bit silly) but I had a lot of fun painting him, and it reminded me why I’m such a fan of Papa Nurgle – lots of rust and decay and opportunities to make your miniatures pop. My only gripe about this miniature, and maybe the newer Plague Marines, is that they have sooooo muuch going on with the miniatures to the point that it’s so busy when it’s done, it’s hard to see the wood for the trees. Sometimes less is more, but whatever! Author PaulPosted on April 24, 2018 Categories Miniature painting and techniquesTags Blight Grenades, Chaos, Death Guard, Foul Blightspawn, Games Workshop, Grognard Games, Nurgle, Nurglings, painting Citadel Miniatures, Painting Competition2 Comments on By Chaos You Are Boooound! 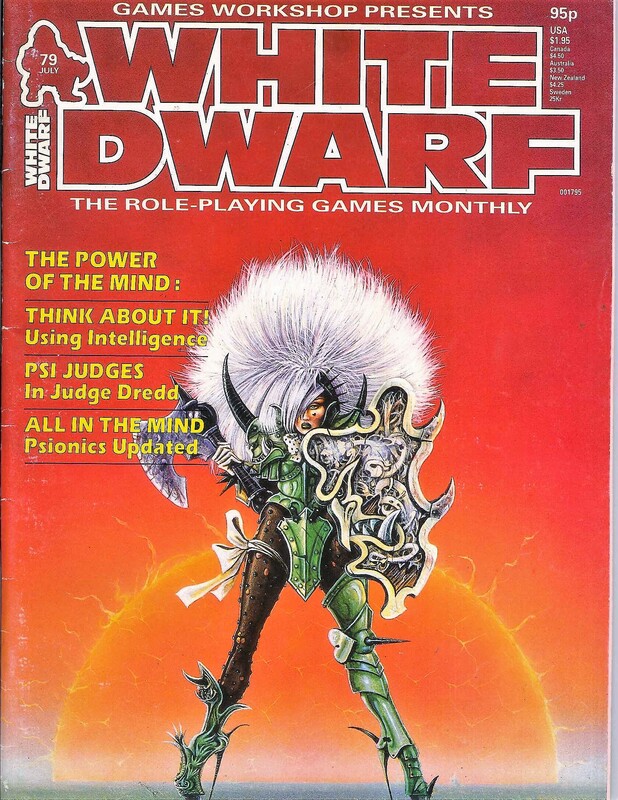 Going through my drawers the other day (not my pants) I found an old back issue copy of White Dwarf. 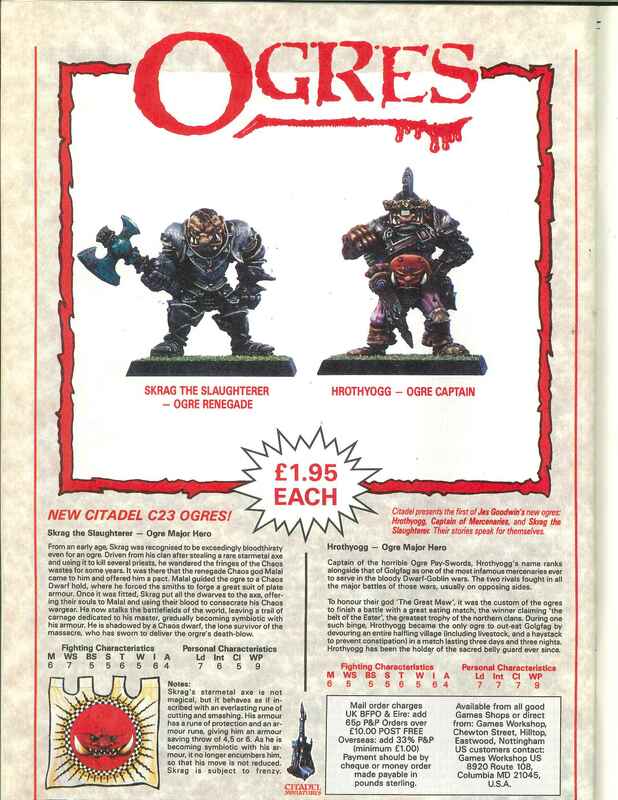 And by old, I don’t mean from the time in the mid-late 90s when GW were painting everything in various shades of red, no I’m talking about an issue from the 80s, July 1986 to be precise, so I thought I would take a look through and do a retrospective of sorts. Sit back in your armchair by the fire and grab a cup of hot chocolate while we fire up the WayBackWhen machine >cue TARDIS like noises<. Right off the bat: The cover. There is the silhouette of the White Dwarf next to the title, then the subtitle: “The Role-Playing Games Monthly”, say whaaaat? Haha! Then the artwork… I must say that this painting has always been a favorite of mine, right from when I first saw it in the Warhammer Fantasy Battle book. Titled ‘Amazonia Gothique’ by Games Workshop alumni John Blanche; it is a glorious, over-the-top image of a female chaos warrior, beautiful but deadly, and with some stunning, well maintained hair… I remember when I was in secondary school I painstakingly copied this image onto my art folder, not in full color, but lovingly shaded with pencil. I always loved the contrast of the green armor, the shock of white hair and the deep oranges in the sky. This remains a favorite of mine, and I would love to own a print of it so I could frame it. 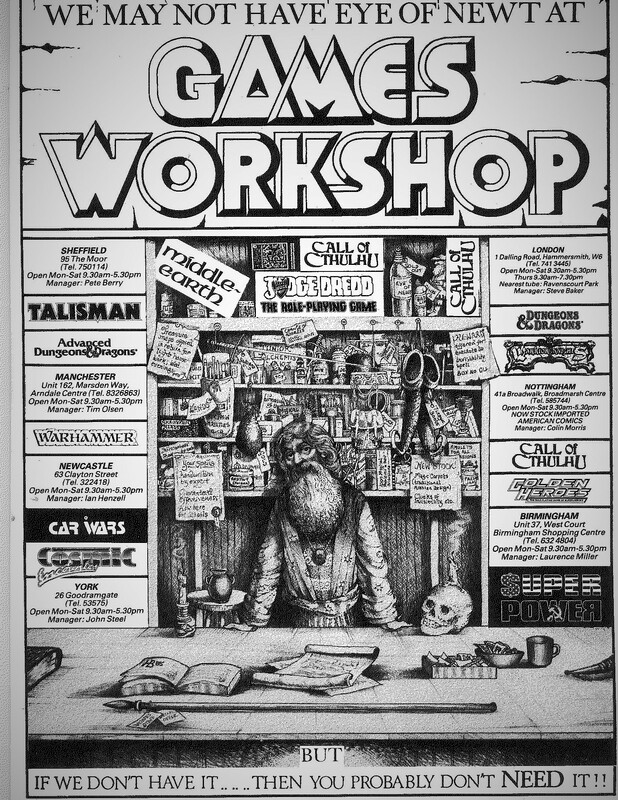 Which reminds me… I must try and track down the miniature GW made of this, there were two versions IIRC? Actually, never mind, I just saw how much they are going for on EvilBay… ugh! Call of Cthulhu scenario ‘Ghost Jackal Kill’ (with lots of Hound of Tindalos shenanigans inside!). Psionics in Advanced Dungeons and Dragons. 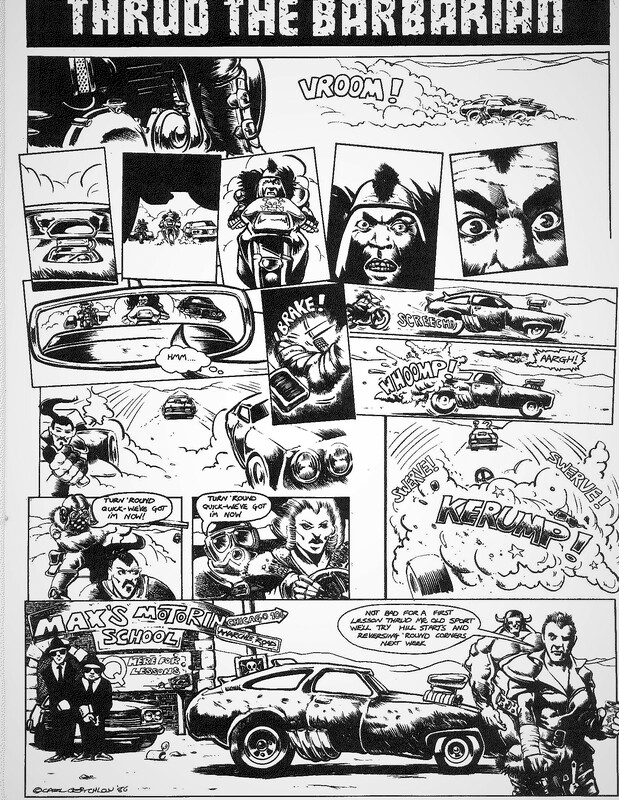 Using PSI Judges in the Judge Dredd role-playing games. 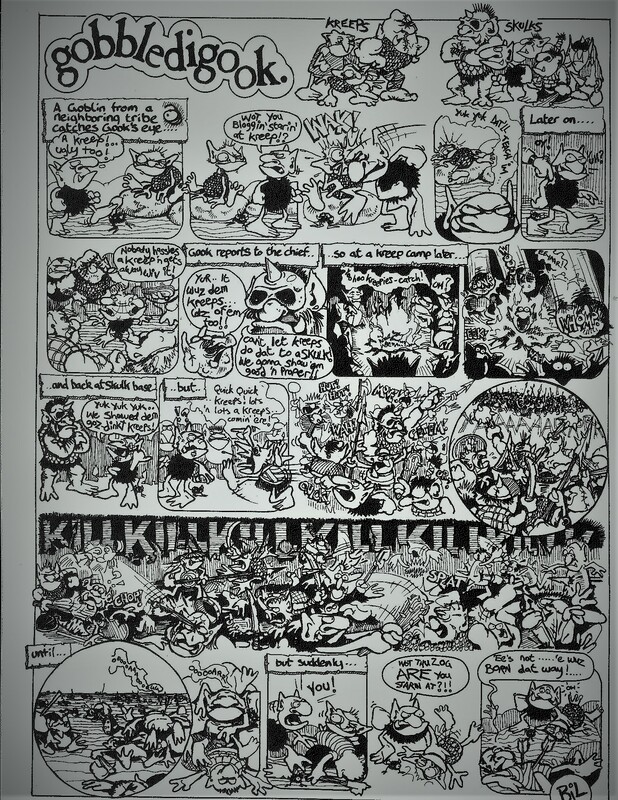 Cartoon strips – anyone remember Thrud the Barbarian and Gobbledigook? Me too!! Letters page (and y’know, nerd rage really isn’t a new thing, is it?). Reviews of some films and games (yes, really!). ‘Eavy Metal – This is a real treat as it’s with Kev ‘Goblinmaster’ Adams and has some beautiful pictures of his work on some of those gorgeous vintage Citadel Minatures. I need a bib. Phwooaaaarrrr! Look at these beauties! Just under two quid a piece! Nostalgia is a strong emotion, and looking through these old back issues is a trip down memory lane for sure. I hope you enjoy these images (used without permission) as much as I do!